People have long looked for ways to improve the look of their smiles. Ancient Egyptians came up with ways to whiten their smiles, and since then there have been lots of developments in cosmetic dentistry. Now, anyone with an imperfect smile can finally find a solution at the office of Dr. James Feigenbaum and Dr. Jenna Feigenbaum in Creve Coeur, MO. Most smiles become lackluster over time due to staining and general discoloration. They don’t have to stay that way, though! Here at Feigenbaum Dental, our team offers both NiteWhite Teeth Whitening and Colgate Optic White as cosmetic options that can brighten your smile in the comfort of your own home. Porcelain veneers could be the perfect cosmetic solution for patients who’d love to transform their smile all at once instead of undergoing multiple procedures. These custom-made, high-quality sheaths of dental porcelain are designed to fit over your natural teeth, hiding aesthetic flaws and creating a new, beautifully lifelike appearance you can feel proud of. Orthodontics is traditionally used to straighten smiles for oral health reasons, but no one can deny that a crooked smile isn’t exactly cosmetically pleasing, so we offer a variety of cosmetic treatments. If you have minor problems with the straightness of your front teeth and would like a quick way to change the look of crooked teeth, we may have a treatment plan available for you. We also offer Invisalign to give you clear braces options at our cosmetic dentistry office in Creve Coeur. Of course, no cosmetic dentistry menu would be complete without teeth whitening and porcelain veneers. We can also create a complete smile makeover plan for you that combine any number of these treatments to help you have the exact smile you want. 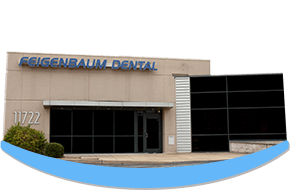 Cosmetic dentistry from Feigenbaum Dental can meet your needs and make your dreams come true. Sometimes, all you need is a simple smile pick up. With cosmetic dental bonding, our dentists can reshape slightly damaged teeth conservatively. While porcelain veneers are often used for patients with chipped or gapped teeth, they require tooth modification prior to placement. If your smile’s damage is minimal, cosmetic dental bonding offers an alternative to porcelain veneers.